The popularity of picanha as a cut of beef to be prepared on the grill (BBQ) hails from Brazil, and that is why the cut is known under its Brazilian (Portuguese) name. It is called rump cover or rump cap in English, or staartstuk in Dutch. It has a triangular shape and is covered by a layer of fat. I use a number of techniques to give it a wonderful smoky flavor as well as serve it tender and medium rare from edge to edge. First I ‘warm age‘ the meat to tenderize it (this step is not needed when the meat has already been dry aged). 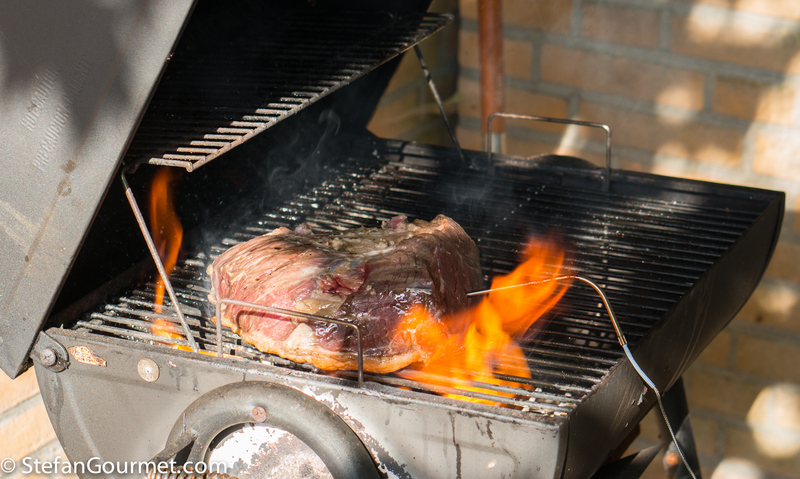 This also speeds up the cooking on the grill, so the inside will be cooked before the outside is overcooked. After searing the outside on a charcoal grill, I put hay on the coals to generate a lot of smoke. 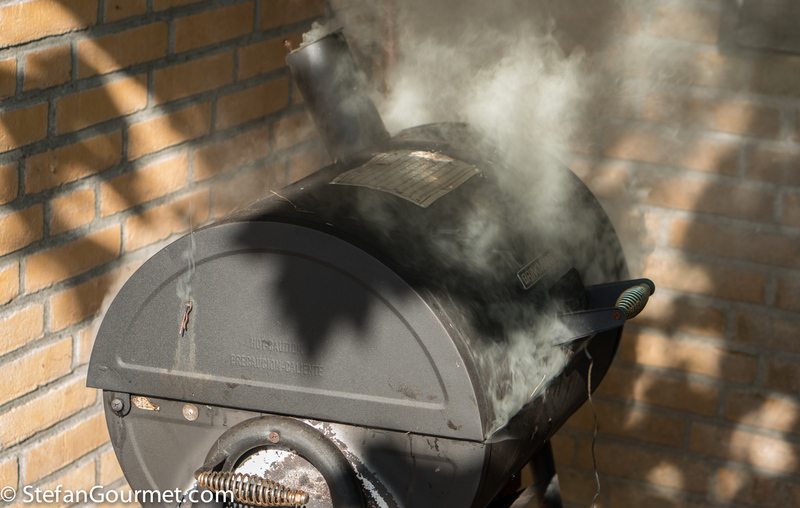 The grill is then closed and the meat is smoked until it reaches the desired core temperature. 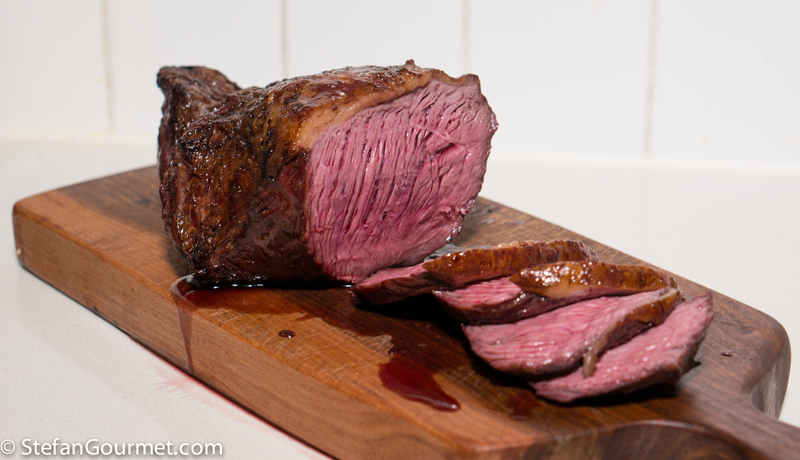 The picanha I used for this is from Simmentaler Fleckvieh, a breed of cattle from the Alps with nice marbling. This beef is grass-fed or even herbs-fed, as the cattle graze in the foothills of the Alps in Southern Germany. 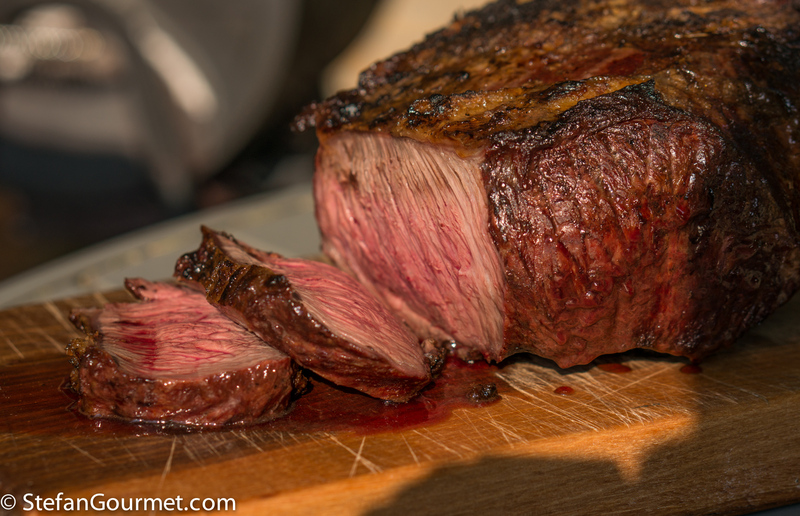 The fat cap on top is great when seared and should not be removed completely, but trimming it a bit is fine as we will only be cooking this on the grill for a short while (so not much of the fat will render). I trimmed a bit of the fat such that a layer of 3 mm (1/8 inch) remained. 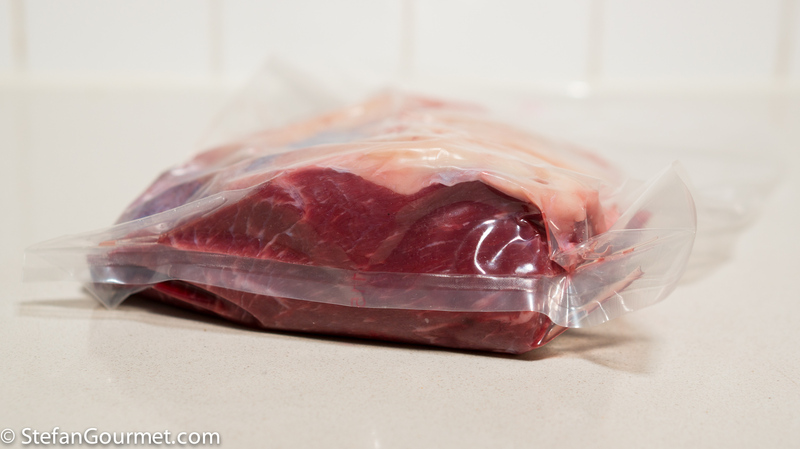 Then I seasoned the picanha with salt on all sides and vacuum sealed it. I then ‘warm aged it’ sous-vide. First for 1 hour at 39.5C/103F, then 1 hour at 49.5C/121F. Depending on the quality of the meat, you can now go straight to the smoking step, or decide to cook the meat sous-vide to tenderize it more. 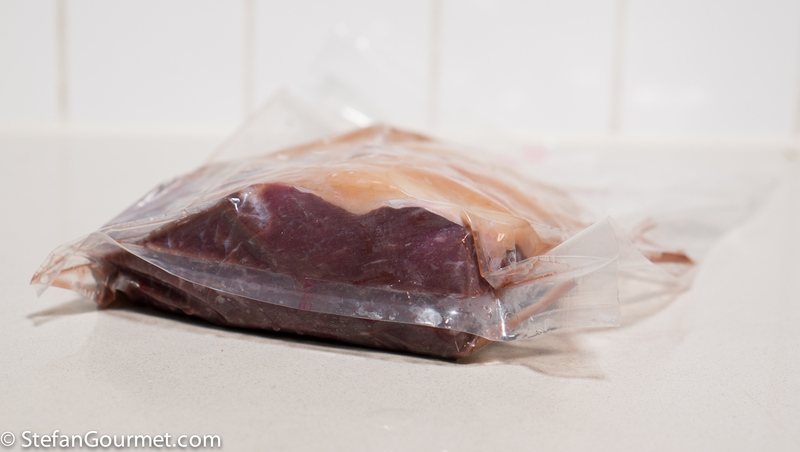 I cooked the picanha sous-vide for 6 hours at 53C/127F. After cooking the meat at 53C/127F, I allowed it to cool for 15 minutes (in ice water). This step is not needed if you only warm age to 49.5C/121F. Then I took the meat out of the bag and patted it dry with paper towels. On the grill a charcoal fire was prepared, with only half of the surface covered by charcoal so both direct and indirect heat are available. I inserted the probe of a digital thermometer into the center of the meat, and seared the meat on the outside directly over the coals. 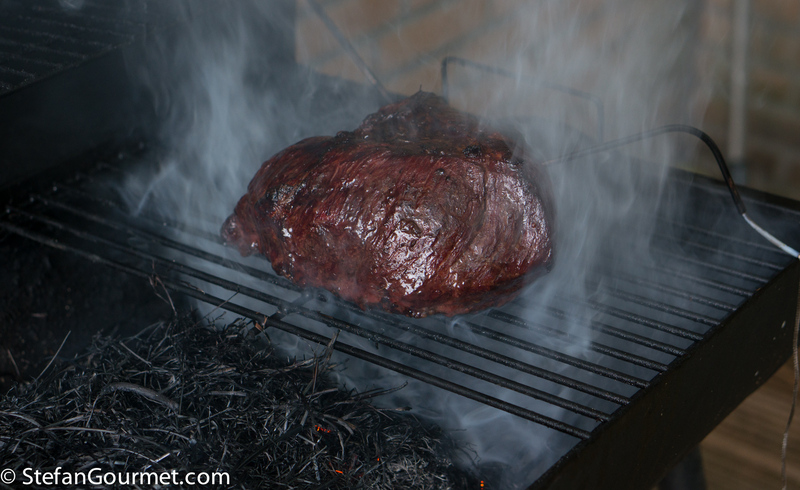 When the meat has been seared on all sides, move it to the side (indirect heat, not over the charcoal). 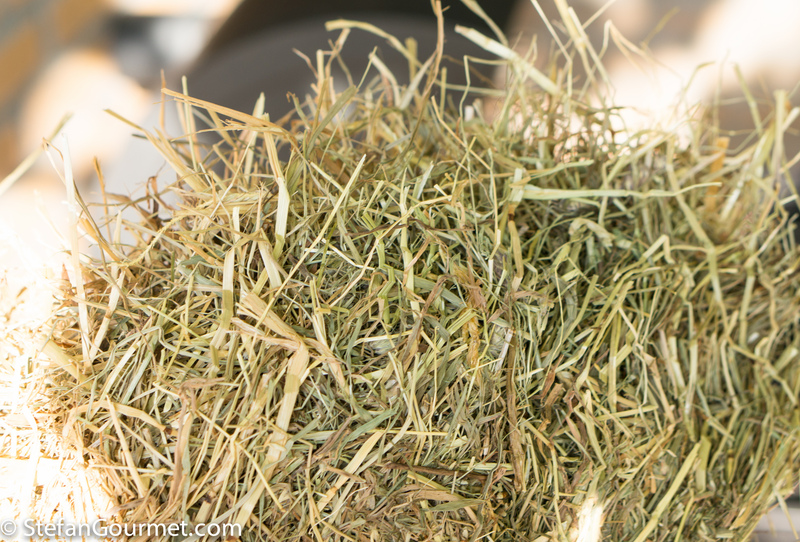 This is organic hay that is available at the pet store (for rabbits and the like). Use a generous amount. …so be prepared to close the grill as soon as possible. 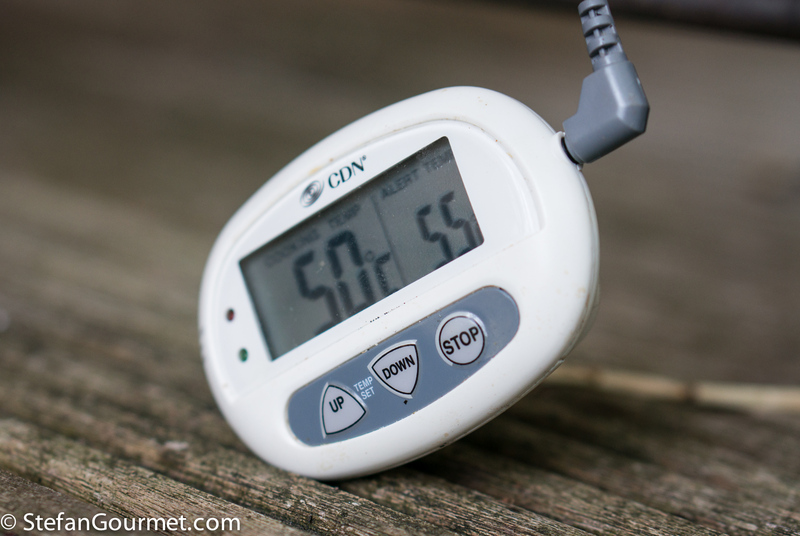 Monitor the core temperature of the meat. …so it will be cooked evenly on all sides. 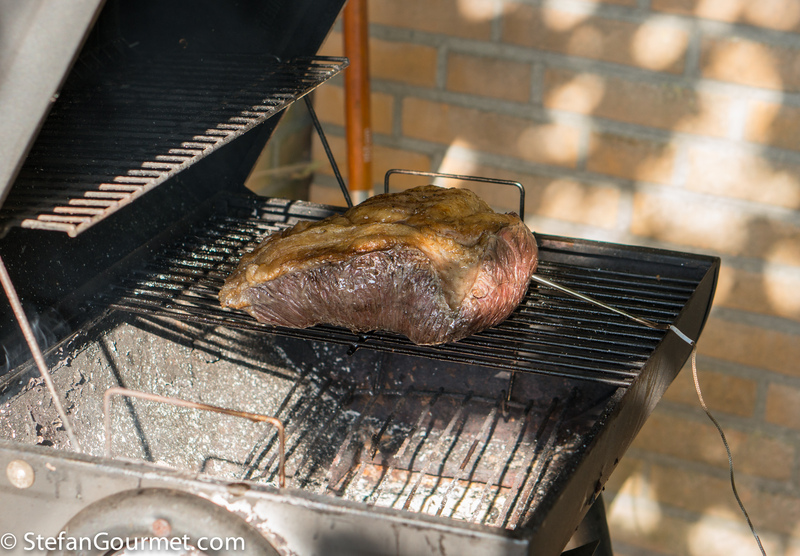 It is done when the core temperature is 55C/131F (medium rare). This will take about 15 minutes, depending on the temperature inside your grill. 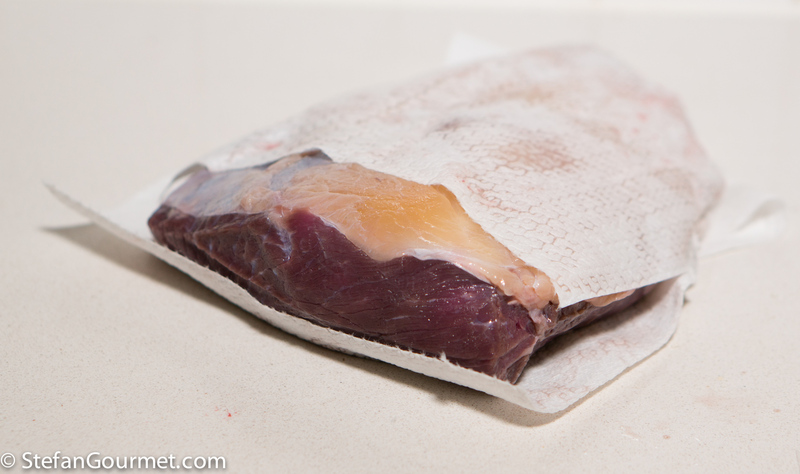 Transfer the meat to a cutting board and allow to rest for 10 minutes, loosely covered with aluminum foil. 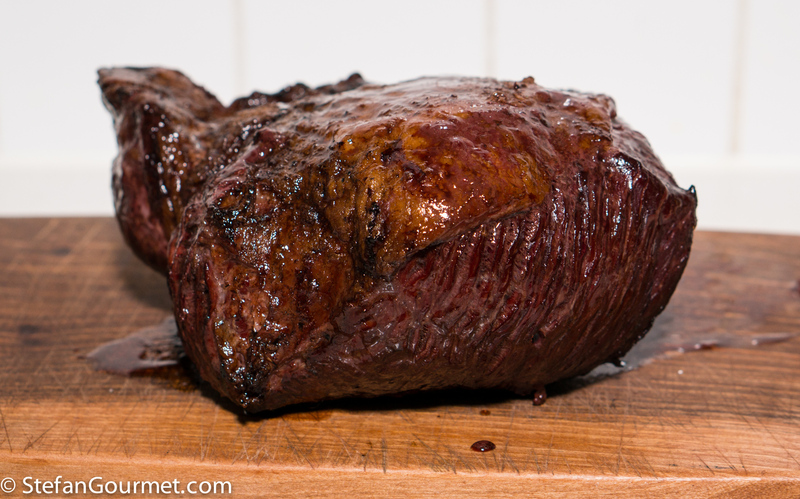 The meat can be carved after resting. 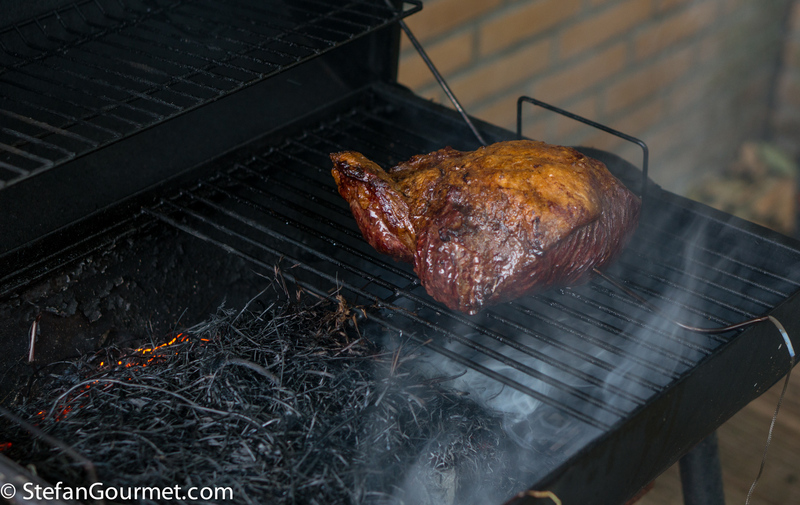 The first time I tried this, I had only warm aged the meat to 39.5C/103F before smoking it. This meant it was cooked on the grill a lot longer to reach a core temperature of 55C/131F, thus overcooking a thick outside layer of the meat. If you like your meat to be medium instead of medium rare, I would recommend to cook it sous-vide to 55C/131F and then smoke it to a core temperature of 60C/140F. (In that case there is no cooling step needed after sous-vide cooking.) Contrary to the photo above, the beef will then be medium from edge to edge. We enjoyed the picanha with a nice Saint-Émilion Grand Cru, Château La Confession 2008. Another Bordeaux would work as well. 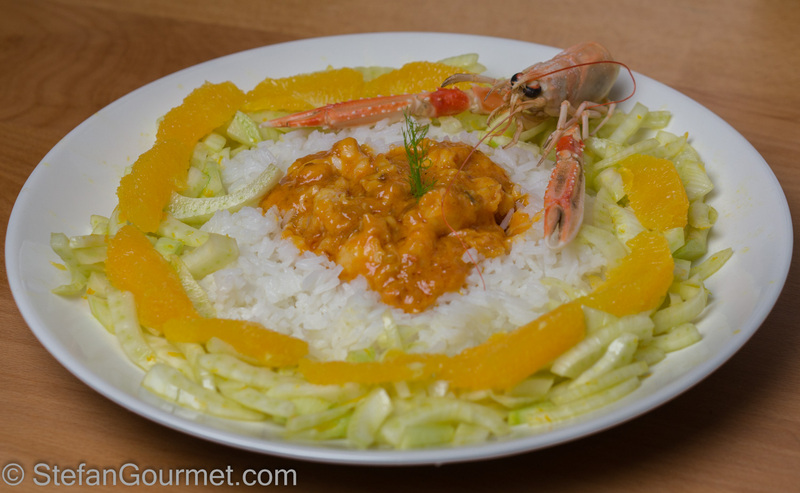 Scampi (langoustines) with orange, cream, and fennel. This looks and sounds delicious. YUM! Looks like it got great flavor from the grill. Neat technique. Looks really good Stefan. 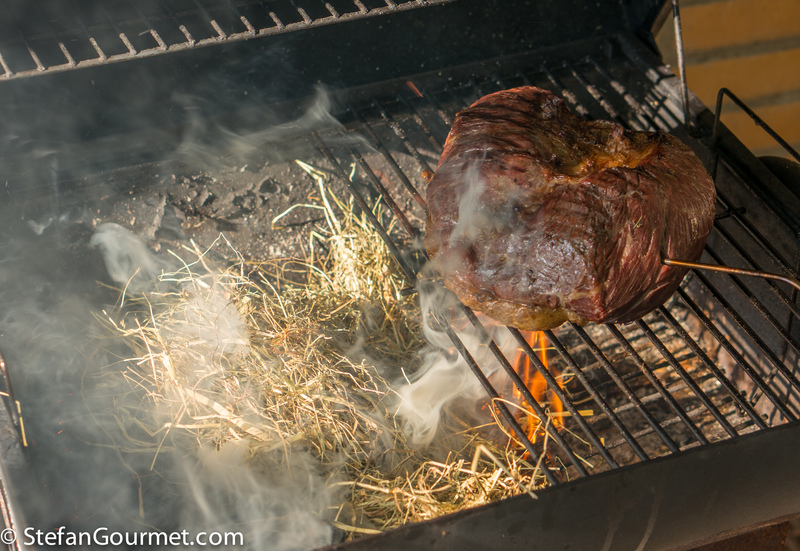 I love the hay smoking post sous vide step. Do you think maybe slicing it at a slight bias to cut through the grain more would be a good idea? Was it tender enough to your liking sliced this way? I cut it this way because I thought it was against the grain (and because each slice would include a bit of the fat cap), but it was tender enough anyway. Hi Hans, this was supposed to be against the grain, but I made a mistake. However, after cooking it sous-vide for 6 hours that was no problem. That warm aging is a fascinating idea. Thanks. Hi Stefan, the warm aging sounds intriguing. I’ll have to give it a try. 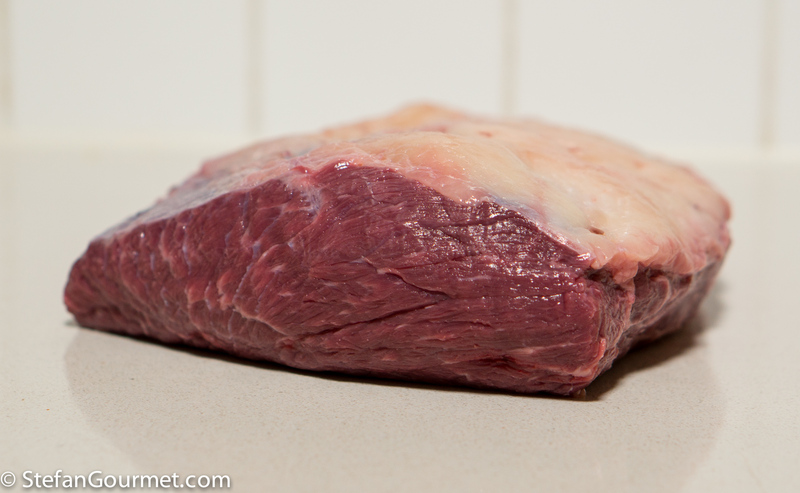 Also, in the USA we call picanha “sirloin cap”. I think I’ll have a try on this receipe. But what about the sauce to add. I’d love to add a rich sauce, what would be your suggestion? I’m struggling with spicy red wine/port like or something with white wine mustard mushrooms? Have some great Christmas Day! Use a decent red wine for this. 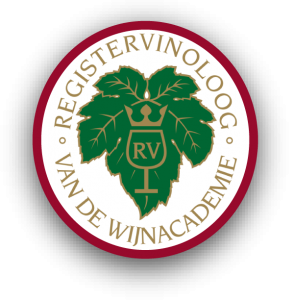 I have good experience with Chateau Coulon from Albert Heijn. A bad wine can be masked with a pinch of sugar, but that is not as good. I think I’ll go for this, not to complicated, as al the pre courses will take some time too. Coulon is also one of our easy favorites! Not sure about your remark about bad wine, wich probably not refers to the Coulon? No it definitely does not refer to the Coulon. If you choose a bad/cheap wine instead of the Coulon, a pinch of sugar can help. If you do use the Coulon for the sauce, it will be great without sugar. Great way to treat the meat! Hi Frans, thanks for reporting back. For lamb I would use only 1/4 of the wine (and definitely no port or figs) and lamb stock. Hi Stefan, thanks for considering the sauce, but I questioned the aging and bbq treatment of the meat. 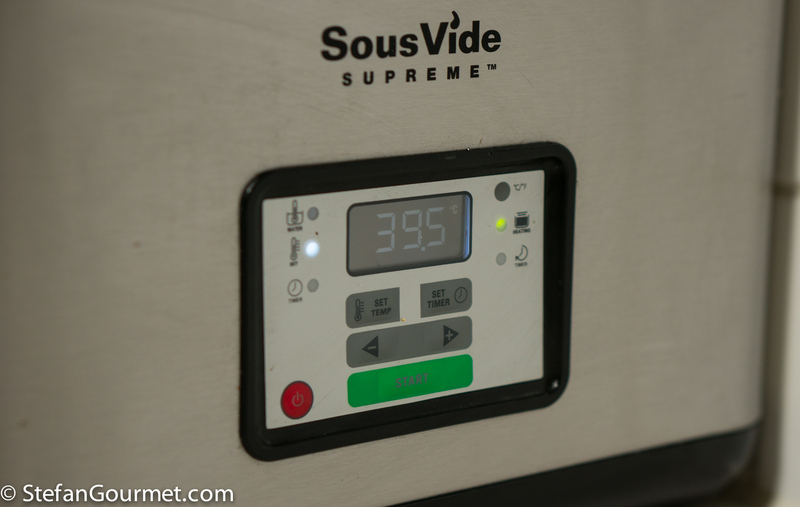 When cooking rack of lamb I always use your Sous vide recipes. But how would the 3 step warm aging and the searing and smoking work on the lamb? I Just tried it and it worked out very well! 3 hours on 55^C in the sous vide. BBQed without hay, but with some small cherry wood chips for the smoke. 5 minutes in my little black egg. One of the best rack of lamb I ever had!